Our Major Sponsors since our formation in 2011 have been Pekish. The support we have received from Dave and Amie since our inception has been nothing short of sensational. We encourage all our players, families and supporters to visit Pekish for a great dining and entertainment experience. Pekish is at the Kooringal Golf Club in Altona, and at the Vue Grande in Queenscliff. Supporters of our multi-media and on-line presence are Bianca and Rob Palazzi from Melbourne Headstones, who have, over the past 5 years, provided the resources for our website and the services of our Web Master, Matt “MCFan” Gibson. Our website, which is undergoing a refurbishment at the moment, is an intergral part of our promotion of the club. One of our long-standing Community Sponsorships has been with Julie and Fab Zavattiero from ARC Electric Services. They are great supporters, and Fab is always on hand to assist behind the scenes. Welcome to our new sponsor, Jim “The Godfather” Gourios, from ASAP Engineering Supplies at 204 Mason St, Newport VIC 3015. Hours 8.00AM – 5.00PM Monday to Friday. Great to have you with us Jim! ASCOT VALE SPORTS AND TROPHIES. Ascot Vale Sports and Trophies have been wonderful friends, not only to our club, but also the FIDA competition as a whole. Jill Dove and her staff, including our sadly-missed advocate and promoter, the late Col Newcombe, are our suppliers of trophies and other coaching equipment. Cakes and Vases in Seddon became our sponsors just in time for Christmas in 2018. Matt and Turkan Hemphill offered us the opportunity to run their Christmas Tree sales at Bunnings West Footscray over 4 weekends. This was extremely successful, and we hope to do it all again at the end of this year. Dave Oakley’s large format printing supplies company, Charti, has been with us since its opening on 22 December 2017. The Charti team will participate in the Great Ocean Road Walk this May (http://greatoceanroadrunfest.com.au/events/great-ocean-road-walk/ ) and we are delighted that they have chosen to have Williamstown Seagulls FIDA FC as their charity. Complete Function Hire has sponsored the trophies for our Trophy Presentation for the last few years. Steve Withers is also one of our Wednesday night SuperCoaches, and is a member of the Executive Committee. Greetings to our new sponsor, Danny Xi of Eleven Edge Financial Planning, who provide quality, expert financial advice. Eleven Edge is at 2 / 131 Hyde Street YARRAVILLE VIC 3013. Danny says it’s an “Absolute honour to be part of it”. Thanks Danny. We’re looking forward to sharing the journey with you. Horner Recruitment, through Peter Langford, have been terrific supporters of the club, including the sponsorship of the “Smoke-Free Zone” signage. A warm welcome to Andy Cocker, of Infinity Natural Wellbeing, which is a retail and wellbeing store for all your inspirational gifts such as jewellery, crystals, books, cd’s and much, much more! Infinity Natural Wellbeing is at 227 Nelson Place, Williamstown, 3016. Great to have you with us for the 2019 season, Andy! Rosamond School has been an important part of our on-going success, and even as we have moved to Incorporated status, Principal Louise Dingley and the School Council have continued their support in making the school’s buses available to us for weekend transport. 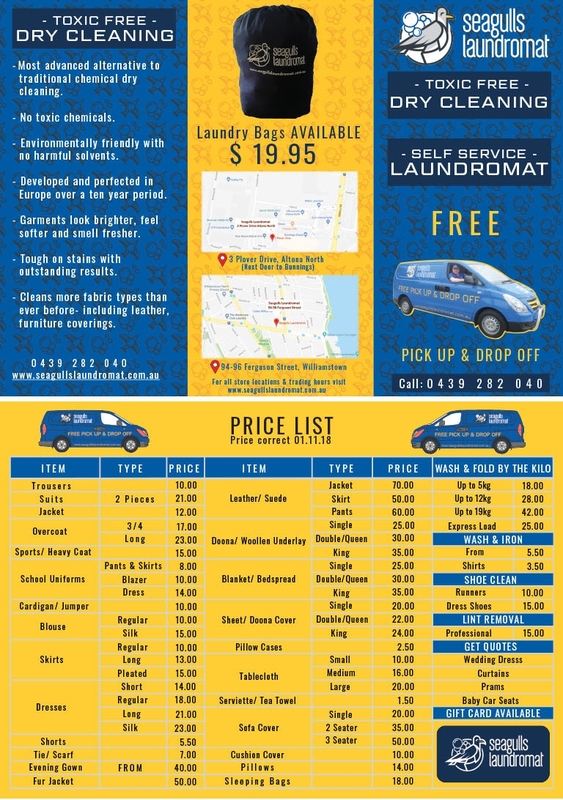 Let’s welcome Fab DeCesaris, from Seagulls Laundromat in Altona and Williamstown. Seagulls Laundromat is actively involved in the local community near the store in Williamstown. They proudly sponsor junior sporting clubs, scout groups and local schools. Welcome, Fab. We look forward to a long and successful partnership.